I think most of us ponder what things would be like if only we could go back and change one or two significant events in our personal history. John has been given that very opportunity when his partner Taylor invents a time machine. Unexpectedly finding himself back in 1986, he realizes he might be able to change the future and prevent a family tragedy that has yet to happen. Being the passionate political activist that he is, along the way he decides that he should also try to find a way to prevent George W. Bush from ever getting elected president. He seeks his younger self out and together they travel cross country to accomplish their mission. Mostly hilarious but unexpectedly poignant moments pepper the entire book. John is expecting to go back and teach and guide his younger self, when he finds that his younger self teaches him a thing or two that he had forgotten. 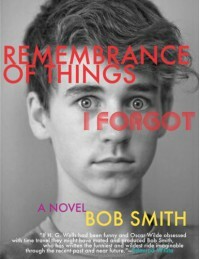 Bob Smith has a great wit and I look forward to reading more of his work.